By the time the trumpets sound, the candles have been lit and the salmon platters garnished. Harald V, King of Norway, enters the room, and 200 guests stand to greet him. Then a chorus of 30 men and women, each wearing a blue police uniform, launches into a spirited rendition of "We Are the World." This isn't cabaret night at Oslo's Royal Palace. 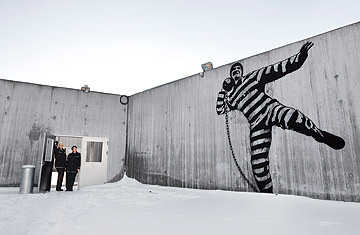 It's a gala to inaugurate Halden Fengsel, Norway's newest prison. Halden, Norway's second largest prison, with a capacity of 252 inmates, opened on April 8. It embodies the guiding principles of the country's penal system: that repressive prisons do not work and that treating prisoners humanely boosts their chances of reintegrating into society. "When they arrive, many of them are in bad shape," Hoidal says, noting that Halden houses drug dealers, murderers and rapists, among others. "We want to build them up, give them confidence through education and work and have them leave as better people." Countries track recidivism rates differently, but even an imperfect comparison suggests the Norwegian model works. Within two years of their release, 20% of Norway's prisoners end up back in jail. In the U.K. and the U.S., the figure hovers between 50% and 60%. Of course, a low level of criminality gives Norway a massive advantage. Its prison roll lists a mere 3,300, or 69 per 100,000 people, compared with 2.3 million in the U.S., or 753 per 100,000  the highest rate in the world. Design plays a key role in Halden's rehabilitation efforts. "The most important thing is that the prison looks as much like the outside world as possible," says Hans Henrik Hoilund, one of the prison's architects. To avoid an institutional feel, exteriors are not concrete but made of bricks, galvanized steel and larch; the buildings seem to have grown organically from the woodlands. And while there is one obvious symbol of incarceration  a 20-ft. (6 m) concrete security wall along the prison's perimeter  trees obscure it, and its top has been rounded off, Hoilund says, "so it isn't too hostile." The cells rival well-appointed college dorm rooms, with their flat-screen TVs and minifridges. Designers chose long vertical windows for the rooms because they let in more sunlight. There are no bars. Every 10 to 12 cells share a living room and kitchen. With their stainless-steel countertops, wraparound sofas and birch-colored coffee tables, they resemble Ikea showrooms. Halden's greatest asset, though, may be the strong relationship between staff and inmates. Prison guards don't carry guns  that creates unnecessary intimidation and social distance  and they routinely eat meals and play sports with the inmates. "Many of the prisoners come from bad homes, so we wanted to create a sense of family," says architect Per Hojgaard Nielsen. Half the guards are women  Hoidal believes this decreases aggression  and prisoners receive questionnaires asking how their experience in prison can be improved. There's plenty of enthusiasm for transforming lives. "None of us were forced to work here. We chose to," says Charlott-Renee Sandvik Clasen, a music teacher in the prison and a member of Halden's security-guard chorus. "Our goal is to give all the prisoners  we call them our pupils  a meaningful life inside these walls." It's warmth like that, not the expensive television sets, that will likely have the most lasting impact.